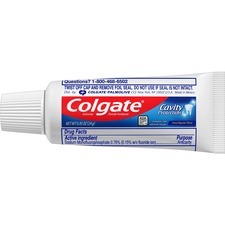 Cavity protection toothpaste cleans and strengthens your teeth with fluoride to protect them against cavities. Great regular flavor leaves your breath smelling fresh and enjoyable. Convenient travel-size tube can be kept virtually anywhere to stay with you anywhere you go. Cavity protection toothpaste is perfect for reducing the amount of dental plaque and bacteria in your mouth. Marketing Information Cavity protection toothpaste cleans and strengthens your teeth with fluoride to protect them against cavities. Great regular flavor leaves your breath smelling fresh and enjoyable. Convenient travel-size tube can be kept virtually anywhere to stay with you anywhere you go. Cavity protection toothpaste is perfect for reducing the amount of dental plaque and bacteria in your mouth.